19th Century Victorian Cup And Saucer Gaudy Stylei. Condition is Used. Dispatched with Royal Mail 2nd Class. In excellent condition no chips or cracks. Has the gaudy colours Staffordshire style cup and saucer. 19th Century Victorian Gaudy Style Cup And Saucer Set Of 6. Condition is Used. Dispatched with Royal Mail 1st Class. In excellent condition no chips or cracks. Has the gaudy colours Staffordshire style cup and saucer. On some of the cups seem to have running in the blue on to the paint work as seen in the photographs. Very rare Gaudy Welsh Leek pattern cup and saucer. Stunning colours and lustre. Cup 6in diam, saucer 4 in diam, 2in height. Cup no chips cracks or restoration. Saucer unfortunately has a 2inch curved crack from edge (see photo). Crack can be felt both sides so the saucer doesn't 'ring true' when tapped. Barely noticeable through blue and lustre from the front. I guess doesn't detract from display just a shame it's there! Stunning Welsh Gaudy LARGE Cup & Saucer. Saucer ~ 61/2" diam. Cup ~ 41/2" diam at rim x 2 2/8" deep. A very old and interesting trio consisting of cup, saucer and plate. Saucers 14cm. Porcelain and China. Side plates 15.5cm. 1 x glaze crazing & hairline crack. 1 x glaze crazing, yellowing, brown stains and chip. 1 x hairline crack. 1 x good condition. seconds quality. There is glaze crazing present on all, including brown marks & stains to the glaze in places as well as yellowing to the handles. There are manifacturing faults and slight irregularities in pattern but otherwise a nice set. THERE IS ALSO A CRACK IN SAUCER WHICH I HAVE PHOTOGRAPHED. IT DOES SHOW THROUGH THE SAUCER, HOWEVER THERE IS SO MUCH PATTERN IT IS HARDLY NOTICEABLE. A very attractive and collectable antique Gaudy Welsh earthenware cup and saucer dating from around 1830 to 1840. This superb example of Gaudy Welsh pottery has been hand painted with the Village pattern, a fairly scarce design. A Victorian Set of Four Gaudy Welsh Saucers and a single Tea Cup. Condition: One saucer and the cup have hairline cracks. Rare Gaudy Welsh miniature cup & saucer. Dispatched with Royal Mail 2nd Class. Scarce Gaudy Welsh Teacup & Saucer Duo. PINWHEEL Pattern. The Colours are vibrant with minimal wear. to the right of the handle is a very fine hairline I thought it was a scratch at 1st as does not appear to follow through. D ECORATIVE GAUDY WELSH CUP & SAUCER. OYSTER PATTERN. MINOR WARE TO SAUCER AND FACTORY FAULT NICK BACK OF SAUCER. MARKED ALLERTONS TO SAUCER. There are manifacturing faults and slight irregularities in pattern but otherwise a nice set. Porcelain and China. seconds quality. All these pieces would have originally been. None of the pieces are backstamped. Gaudy Welsh cup and saucer. Great colours and pattern. Great colours and pattern. This cup and saucer will grace any collection of Gaudy Welsh, a real eye catching talking point.There is a very fine hairline crack on the base of the cup handle (Does not effect the handle and cannot be seen when on display). 19th century porcelain tea set decorated in the Gaudy Welsh 'Floret' pattern. TYPICAL SWANSEA SHAPED HANDLE, LOVELY BASKET GAUDY WELSH DECORATION. Antique Gaudy Welsh Teacup and saucer. Teacup has hairline damage. 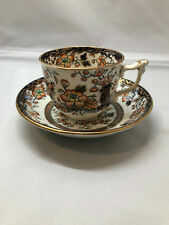 Antique Gaudy Welsh teacup and saucer. Antique Gaudy Welsh. TEACUP and SAUCER. It has also sustained a small crack at the base of the handle, again, clearly visible in one of the photos. Although the inside of the cup is tea stained, probably from decades of use, the colours on the exterior is still bright and vibrant after all the years. This is a rather neat little Gaudy Welsh cup & Saucer, in the Tulip patter. Antique English Pottery : A pearlware B&W Cup & Saucer C.1810. An attractive early 19th-century pearlware double handled Cup and Saucer decorated in blue and white with burnt orange trim. Circa: about 1810. This interesting moustache cup and saucer is in used antique condition with respective wear and tear, marks, a small chip on the rim of the cup and on the base. The gold finish around the rim of both cup and saucer is worn. GAUDY WELSH CUP & SAUCER AND PLATE. OYSTER PATTERN. MINI FRIT TO CUP EDGE,MINI CHIP SAUCER BOTTOM MIDDLE EDGE,MINI FACTORY FAULT NICK TO PLATE BACK EDGE. Early 20th Century Allerton Ironstone/Ceramic Pottery. Green ‘Como’ Pattern. Gaudy Welsh first appeared in Staffordshire in the late 1820’s. The colours chosen for decoration were usually cobalt blue, shades of orange and green, further embellished with turquoise, lemon, pink and accented with gilt and pink lustre. Very Good Condition. 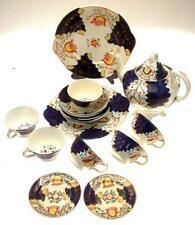 Victorian China England Gaudy Welsh, Tulip Pattern, hand painted in cobalt blue, rust, yellow and green. 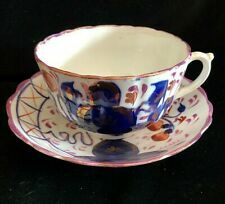 Antique English Pottery : A good Gaudy Welsh Cup & Saucer C.19thC. A good Gaudy Welsh Cup & Saucer. Unusual pattern - nice band painting around outside. unusual handle shape. TYPICAL SWANSEA SHAPED HANDLE, LOVELY CRISS CROSS DECORATION. Antique 19th. Century Gaudy Welsh Cup And Saucer. The cup is approx 2 inches tall and approx 3.75 inches across. The Saucer is approx 6 inches across. As can be seen in the photos the colouring on the cup and saucer are not exactly the same so I am not sure if these items originally began life together but still look good together. As far as I can see there is no damage to the items. D ECORATIVE GAUDY WELSH TRIO. TULIP PATTERN.